Just as with 2 weeks ago, I was planning to go to Biggleswade Town v Slough Town. But yet again it was called off due to cup commitments on Slough's part. Originally it was their FA Cup tie against Mansfield Town, which sadly they lost on penalties. But this time it was a competition of slightly less importance - the Red Insure sponsored Southern League Cup - a tie at my mate Anwar's local team, Aylesbury. So he had been planning to go there and I had been planning to go to Carshalton Athletic v Enfield Town. But on the morning of the game Aylesbury called their game off, and Hednesford Town - a ground we had both wanted to go to, confirmed that their game was on. So I text Anwar and asked if he was up for it. He said yes, and so we made arrangements of where and when to meet. It turned out to be a blessing in disguise as the Carshalton game was later called off. I did have Horsham v Worthing as a backup, however. So after the usual hard slog at work, I had just over an hour to relax and catch up at home before setting off to meet Anwar at 3.50. I got to Aylesbury at 4.15. Soon we were on our way. Trips up north are the same distance more or less going via Aylesbury are more or less the same distance as going directly from Wycombe, however, it does take a fair bit longer, as the route from there to the M40 meaning half an hour drive along A roads which are pretty slow moving in places. But once we got on the M40 it was fine, and for most of the M42 as well. But the M6 had a load of delays, over an hours worth in fact, so it was a good thing that we allowed extra time, as we got there at 7.25, if we would have left much later we would missed the kickoff. After paying to get in and having a look round the ground, the first port of call was the club shop. There was a decent selection of programmes there, but nothing that I needed. There were also pennants, but at a fiver each, I decided against it. Next stop was the tea bar. After getting some chips, it was nearly time for kick off and so we took our place in the big side terrace. We got chatting to a friendly Walsall fan who like us enjoyed going to other games. 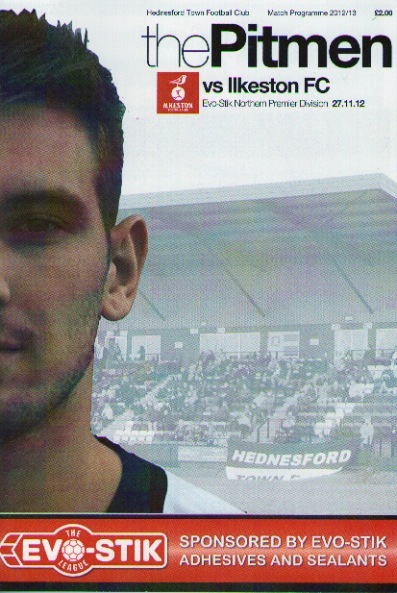 The game itself was pretty good, an entertaining encounter which Hednesford shaded. But it was still 0-0 at halftime. At the interval, we got some more chips, which turned out to be a huge portion compared to the first, so I was pretty full after that. I also bought a Bovril to warm me up. If the home side shaded the first half, they totally dominated the second. After barely a minute of the game restarting, Hednesford were 1-0 up when former AFC Telford player Elliot Durrell scored a great goal that went in off the bar. They went onto dominate the half, but it wasn't till the 88th minute that victory was sealed. A home player went down in the area and the referee awarded a penalty. Despite a valiant effort from Ilkeston keeper Ashley Timms, it was that man Durell whose powerful penalty made it 2-0 and game, set and match. After 5 minutes of injury time, the victory was confirmed. The Hednesford fans, by the way, were in good voice and sang a number of decent songs. Ilkeston also bought a fair following for a midweek game and sang a few songs. We made a pretty quick getaway, getting back to Aylesbury at 11.40, meaning that I was back home around midnight, after a traffic free journey. Having no work meant that I could stay up for a few hours and have a drink or two, I eventually got to sleep just before 3. KEYS PARK is a fantastic non-league ground, having been built for their days in the Conference. It would put a few football league grounds to shame to be honest. As well as a good club shop, there is a tea bar that does your usual range of football stuff, all at reasonable prices. The town is around 15 minutes walk away, and probably has a better range of pubs and food places, though I didn't confirm in person. The MAIN STAND has 710 seats. It has a smart design and has the club bar and conferencing facilities behind it. This stand is accessed by different turnstiles to the terrace, and you have to pay a pound extra to go in here, compared to the terrace. The other area of seating is the HEDNESFORD END, with a capacity of 301. This looks to be the away end if segregation is in force, as it has separate turnstiles. There is also uncovered standing for around 500 more in this area. Along the far side, the WIMBLEBURY TERRACE is also large and covered and holds 2752 In addition, there is uncovered standing for 250 more between this and the main stand.At the opposite end, is the HEATH HAYES END has a capacity of 1752 and is a large covered terrace. I'm pleased that you and Anwar enjoyed your trip to Keys Park and for your positive comments about our club.